This article is part of the Purchase Order Module. Click here for more information and training on Purchase Orders. To manually create a Purchase Order off-schedule, hover over the 'Vendor' menu in the top ribbon, then hover over the 'Purchasing' sub-menu and select 'Purchase Order'. This will open the Purchase Order form in a new tab where the Use can create a manual off-schedule Purchase Order. Submit/Unsubmit Menus – depending on the status of the PO, this menu will display 'Submit' or 'Unsubmit'. Note: User Email Settings must be correctly set up before a User can send emails via R365. The PO file will be sent to the Email Address on the Vendor Record. 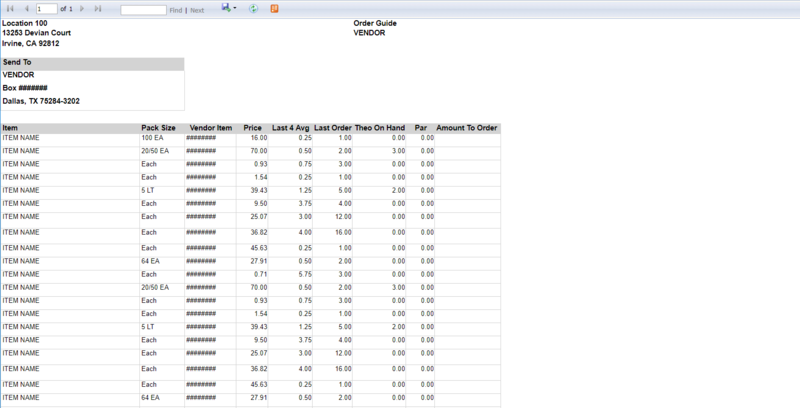 POs can be delivered in either .CSV or .PDF format (set on the Vendor Record). If no email exists on the Vendor Record, a pop-up window will request the email address – the email address will be saved in the Vendor Record for future orders. Only Users with the Accounting Manager; Full Access or Submit Purchase Order roles can Submit Purchase Orders. Refer to Security Roles training for more information. Unsubmit Menu - this menu replaces the 'Submit' menu after a PO has been submitted, but not invoiced. If an error was made on the submitted PO, use this menu to 'Unsubmit' the PO, and make the needed changes or delete the PO entirely. Start with Template – Allows the user to choose a Memorized Purchase Order to populate the Manual Purchase Order. Refer to Memorized Purchase Orders for more information. The Details section is where the User will select and enter quantities for the Items that will be ordered. Once either of the first two options is chosen, a new window appears to ask for the Consumption and Buffer Days. Note: the Consumption and Buffer Days will auto-fill if this PO Form was started with a Memorized PO.